Ghost and words is a continuation from Evolutionary Pac-Man. It uses the same strategy of breaking down words (in this case, using paragraphs from Wikipedia's Pac-Man page) as "food", and also having "poison" or "ghost" that can kill the pac-mans. The initial idea was simple - I wanted the words to act and animate as vectors. It also seemed interesting to use the correlation between actual meanings of words through such method like Word2vec, but I got stuck and spent too much time on other parts and didn't really get to that level. 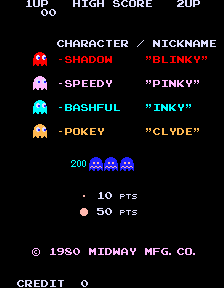 Evolutionary Pac-Man was revisited because it was already using one unique way of converting text into many vector points. The renewed version more specifically focuses on typographic aspects, by turning (almost) every element into text. In this game, texts do many things. They get eaten, run away or run towards, or sometimes get killed or starve to death. So at this point, it's ran with four different arrays of ghost, which I think is bit redundant and I would like to make it simpler in the future. The Dialogflow V2 Unity Plugin is a continuation from Api.ai: Unity Plugin, which made it easy to integrate the Dialogflow(Api.ai) natural language processing API into your Unity project. It's built as a team project in Open Source Studio at ITP and not an official plugin from Google or Unity. Responsible for project management and documentation. The project is selected for xStory, and will be continued on its development and documentation. Week 4 assignment based on Drawing ttf with p5js commands + ML5 PitchDetection examples. It's always intriguing to see type itself reacting to sound, but it also makes me question what is the most natural/fitting typographic form to another data, such as: if the current transition of moving left to right goes along with concept of "pitch". Generating asemic writing in grid - based on Recursive forms (homage to Anders Hoff) example. "knowledge and love of Afghanistan is great even as he regrets the limits of his understanding"
This emptiness is clearest in the poems “Burkina Faso is Great,” “Central African Republic is Great,” and “Equatorial Guinea is Great,” each of which contains only a title on a blank page. As Shirinyan notes in his preface, “no one who could write in English and had access to the web thought to say anything great about those countries” in September 2006 when he conducted his searches. The images continue to refresh, each remaining on screen just long enough to catch the reader’s eye before disappearing, while the text remains onscreen until the next click of the mouse. Between 2013 and 2014, von Petzinger visited 52 caves in France, Spain, Italy and Portugal. 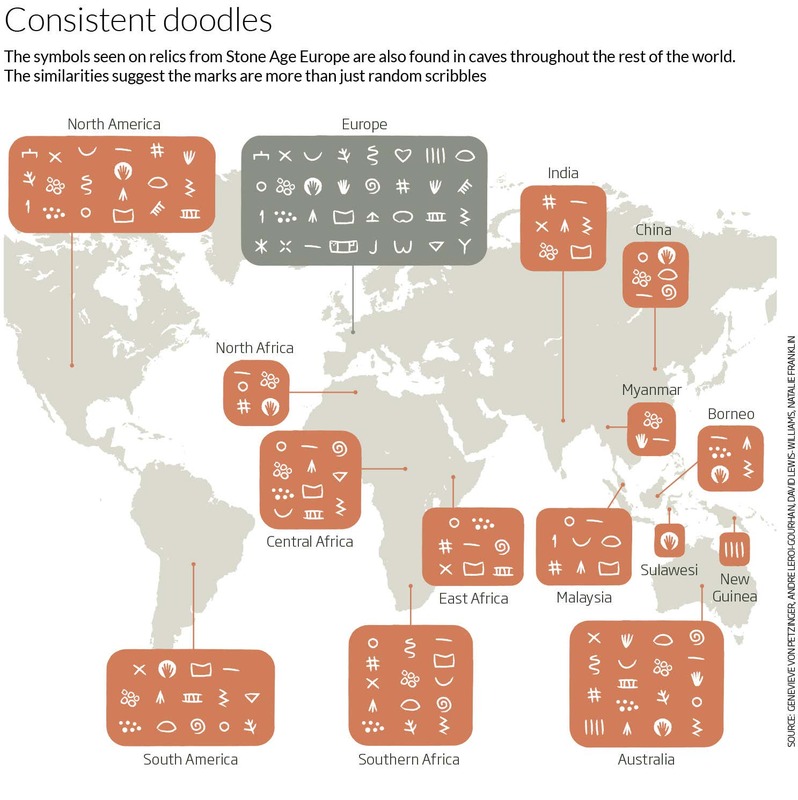 The symbols she found ranged from dots, lines, triangles, squares and zigzags to more complex forms like ladder shapes, hand stencils, something called a tectiform that looks a bit like a post with a roof, and feather shapes called penniforms. In some places, the signs were part of bigger paintings. 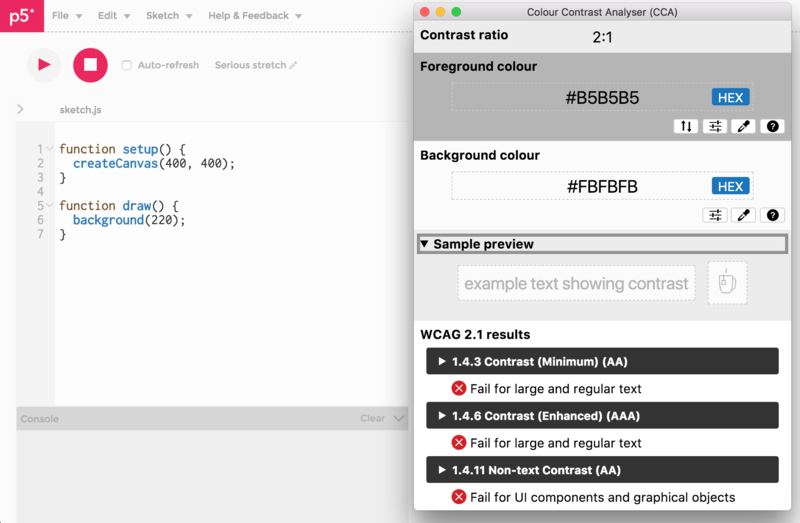 "The ability of humans to produce a system of signs..."
For accessibility assignment, I looked into p5 editor with Colour Contrast Analyser (CCA). 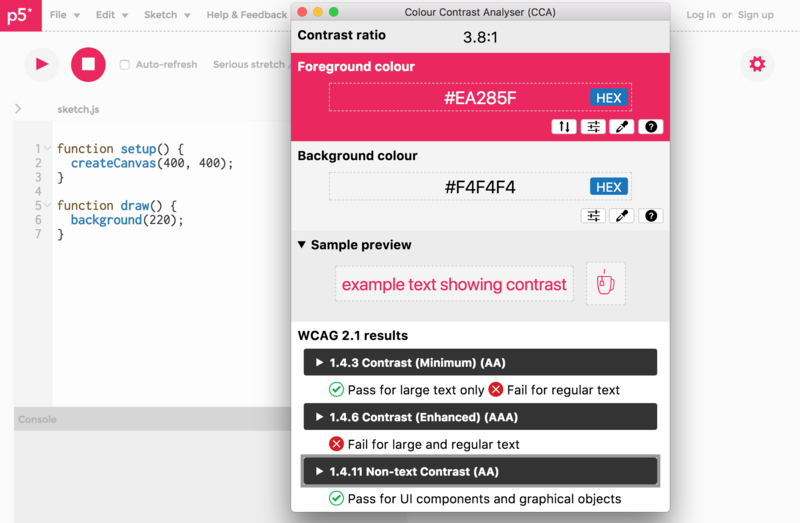 The CCA helps to figure out the legibility of text and the contrast of visual elements, along with further useful information like color blindness simulator. The first input I tried on was contrast between grey text and lighter grey(?) background. I used the color picker, and it came out as #B5B5B5 for text (File, Edit, Sketch, Help&Feedback, Auto-refresh...etc) and#FBFBFB for background. Unfortunately, the contrast ratio was 2:1, which fulfill neither "minimum" nor "enhanced" standard for both large and regular text display. The good news is that p5's point color, #EA285F, which is often used for UI components and logo resulted enough ratio to satisfy Contrast (Minimum) for large text, and most importantly, passed the Non-text Contrast. On the other hand, although the same pink color is used for hover text - it still fails for regular text contrast.